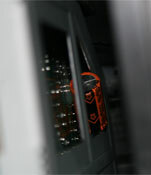 View of power supply still connected. Screw at top of metal bracket holding it in. 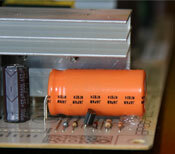 Bad capacitor side of the board. Cap on far right and towards left under the heat sink are bad. The 2 bad caps removed. You can see the tops poped up and leaking. This meant I did not have to try to remove the heatsink. Note that the board has a little + sign silk screened on it to show you the polarity when installing the caps. The caps have a black or white streak with -'s in it the points to the negative lead. The other lead is the positive lead and should be through the hole marked with the +. End view of board with new caps soldered in. I used hot glue under the caps once soldered since they were so much large and mounted sideways. Note that the caps I had were the old style large ones. I had to carefully position them so they were out of the way. Cap on top (CM860) with glue under it. Cap on back fitted in the window in the bracket. If you do this make sure your leads are not going to touch the bracket and short out. Bottom of board back in TV. Note the small amount of room between the plsatic track and the top mounted cap. Cap on back visible in TV. The TV is already disconnected and open, might as well clean it. I think there is a fan in there, to the left of the cable card slot. Might as well vacuum it. 2 fans removed for cleaning. There is a bracket held on by 3 screws that holds the fans in. Do NOT stick your hand in there! They are also easily bent, which would reduce air flow, so be careful cleaning. Fans back in and cleaner.